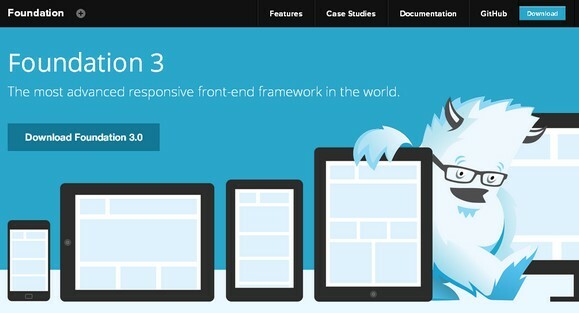 Foundation 3 is built on ZURB’s 14 years of experience at building sites and apps for the Web. It is built with Sass, a powerful CSS preprocessor, which allows us to much more quickly develop Foundation itself, as well as sites built with it. You can use the Sass or straight CSS version of Foundation. New button elements, new navigation types, new form styles and options, and tons of streamlining make this the fastest way to prototype responsively, and to take that code and go right to production. Foundation 3 works all the way back to IE8, they are taking advantage of new, awesome Web technology to help you build better and faster. Call me a troll of you like but I think its really amazing that Zurb built a frame work that is totally incompatible with IE7 at its very core but did not choose to implement that framework themselves. Could it be the business side of Zurb is not willing to abandon their users still clinging to an old browser? I know my managers are not willing to throw away potential business from 12% of our traffic. I like the boldness of their direction but until they actually use it themselves, its all talk. “Foundation 3 works all the way back to IE8″Wow! What a long way! It seems to be a bad joke. Want a real framework, look at YAML. It works even with IE6. IE7 is no longer supported as a valid browser by companies like Disney, Facebook, even Google. For every developer that supports IE7, you’re just adding to the problem. Like giving crack to a crackhead instead of eliminating crack altogether. One online retailer even put up a tax on their online store for IE7 users, yes you heard correctly a IE7 tax. So quick… run! Tell your bosses! Andy, Foundation 2.2 is still available. It supports IE7 and is a solid framework. 3.0 looks to the future and drops support for older browsers. We use this in our work everyday. IE7 is now below 1.6% of GB visitors http://gs.statcounter.com/#browser_version-GB-monthly-201106-201206 and 1.4% worldwide its not like it doesn’t support it at all it will just have limited support I find that quite acceptable under 2%. It does make it sound a bit elaborate to saying support all the way back to IE8. at the end of the day IE8 was released just over 3 years ago (seems a lifetime to me) in the same year as the first chrome and firefox 3.5.